Left to Right: HE Consul General of Belgium Michèle Deneffe, HE Consul from the Consulate General of India, Mr. Karun Bansal, Mr. Peter Macken, CEO HRD Antwerp, MR. Ramesh Virani President of HKIDA and HE Consul from the Consulate General of India, Mr. Narayan Singh. HRD Antwerp is happy to announce the inauguration of its new Hong Kong office following a relocation from its old premises. 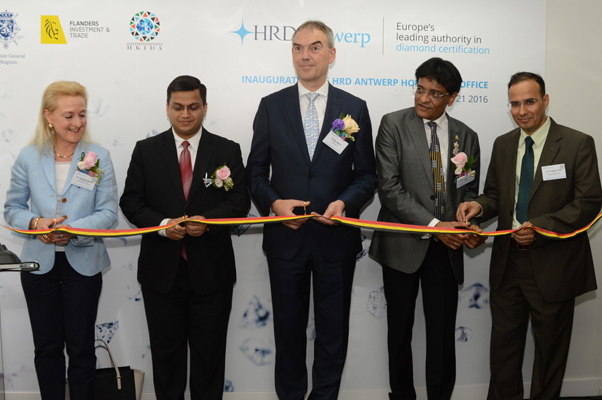 The official opening of the new HRD Antwerp office, located at Unit 1204 A 12/F Harbour Centre 2 Hok Cheung Street 8 Hunghom Kowloon Hong Kong, took place on April 21st and was attended by Belgian and Indian government officials in addition to the HKIDA management team and leading diamond and diamond jewellery companies. The new HRD Antwerp office is located in the same premises as the Hong Kong Indian Diamond Association (HKIDA) with whom it recently also signed a MoU concerning the screening of melee diamond parcels using the M-Screen , world’s fastest melee screening device available recently. “In addition to the introduction of the highly anticipated melee screening service, the relocation of our Hong Kong operations to the HKIDA premises, is a sound move forward towards strengthening our local presence“ says Peter Macken, CEO HRD Antwerp. “As HKIDA’s aim is to safeguard consumer confidence throughout the diamond industry while protecting the natural diamond trade, the service agreement concerning the use of the M-Screen is a great step forward in offering our members the tool they need to make absolutely sure their melee diamond parcels are free of lab-grown diamonds” explains Mr. Ramesh Virani, President HKIDA.